One of the most charming cakes for any occasion is the topsy turvy or mad hatter cake. One of the most charming cakes for any occasion is the topsy turvy or mad hatter cake. The crooked gravity defining layers of this cake might seem baffling if you are not familiar with the straight forward construction that goes into the creation. Although these cakes look like they are about to topple over they are quite stable and can be a snap to make even for a beginner cake designer although you will probably spend more time than on a regular cake. Topsy turvy cakes can be two tiers high or several stacked layers and the options for decorating them are almost limitless. Any type of decorating technique you would use on a regular stacked cake will also work here. These unique cake creations are usually encased in fondant and further enhanced with more gum paste or fondant cut outs in whimsical shapes, pearls or even draped like fabric. You can use butter cream to cover and decorate this style of cake or a mix of both fondant and butter cream. The cake can be an explosion of pretty colors or even simply white or cream for a more elegant presentation. Fondant seems to be the material of choice for most decorators creating these incredible constructions. Many years ago the only way to use fondant or gum paste in your cake designs was to make it yourself. This step was simply part of the process and beginner designers had to learn the right recipes and techniques to create a successful end product. These days you can purchase premade fondant and gum paste which is easier and of course does not require an expensive heavy mixer. Premade fondant and gum paste are great for beginners and for practicing cake design techniques because of the convenience factor. These products are usually high quality and produce nice results. However, sometimes the taste can be unpleasant and they might require extensive kneading and working to become pliable. Homemade gum paste and fondant are definitely superior products on many levels despite the extra work required to make them. You usually get a very large batch from most recipes which cuts the cost and can be frozen for future use. Homemade fondant can be flavored any way you want and usually is easier to roll and form than ready made products. This lessens the chances of tearing and cracking on the finished cakes. There are many resources and classes available for those who wish to try their hand at this design style. 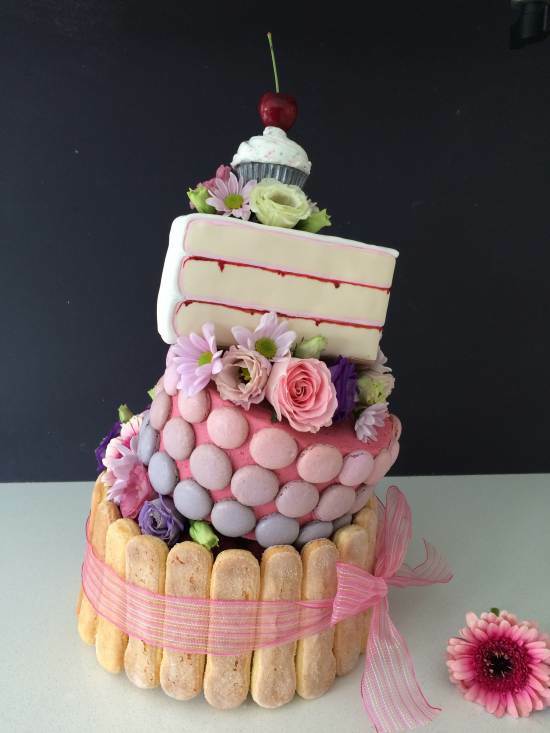 The time required to bake, assemble and decorate a topsy turvy cake is worth it to create such a fantastic addition to any event.